He was born in Moscow, 1994. Alexander graduated the Children's Music School under the Chopin Moscow State College of Music Performance majoring in piano (class of Irina Tursova). 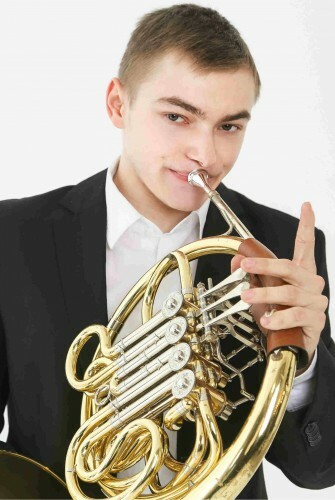 In 2014 he graduated as hornist with honors the Chopin Moscow State College of Music Performance (class of Honored Artist of Russia Anatoly Tokarev). He is currently the student of the Tchaikovsky Moscow State Conservatory (class of Honored Artist of Russia, Professor Vladimir Shish). 2014 - II Prize Winner of the III International Savely Orlov music competition and festival (Moscow). 2015 - Diploma Holder of VII International Competition of Moscow Conservatory for performers on wind and percussion instruments (Moscow). 2018 - laureate of the II priza at the All-Russian competition of symphonic orchestra artists (Moscow). He took part in master classes of Eric Ralske and Christian Lampert. He was the member of master classes at Rheinau Project (Switzerland, 2014) and "Educational Bridge" project (Boston, 2017). Soloist of the Russian National Youth Symphony Orchestra.